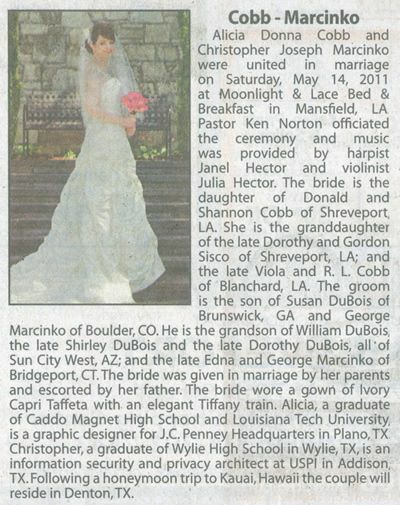 This is christoperj|[.com]: Press @ Shreveport Times -- "Cobb - Marcinko"
"Alicia Donna Cobb and Christopher Joseph Marcinko were united in marriage on Saturday, May 14, 2011 at Moonlight & Lace Bed & Breakfast in Mansfield, LA. Pastor Ken Norton officiated the ceremony and music was provided by harpist Janel Hector and violinist Julia Hector. The bride is the daughter of Donald and Shannon Cobb of Shreveport, LA. She is the granddaughter of the late Dorothy and Gordon Sisco of Shreveport, LA; and the late Viola and R. L. Cobb of Blanchard, LA. The groom is the son of Susan DuBois of Brunswick, GA and George Marcinko of Boulder, CO. He is the grandson of William DuBois, the late Shirley DuBois and the late Dorothy DuBois, all of Sun City West, AZ; and the late Edna and George Marcinko of Bridgeport, CT. The bride was given in marriage by her parents and escorted by her father. 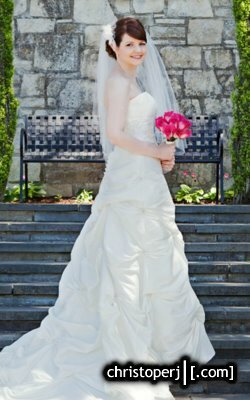 The bride wore a gown of Ivory Capri Taffeta with an elegant Tiffany train. Alicia, a graduate of Caddo Magnet High School and Louisiana Tech University, is a graphic designer for J.C. Penney Headquarters in Plano, TX. Christopher, a graduate of Wylie High School in Wylie, TX, is an information security and privacy architect at USPI in Addison, TX. Following a honeymoon trip to Kauai, Hawaii the couple will reside in Denton, TX."